A Frost & Reed print. Frame: 1" gold distressed with double cream mounts. Condition: Excellent, but 1" tear top right, not noticeable. An original titled print, Second State. Frame: 27x35ins. 1" gold with dark green mount. Published by Frost & Reed. 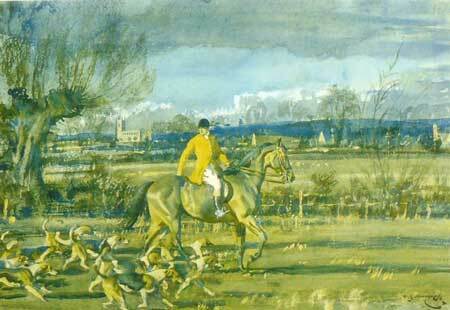 A November Morning in Pytchely Country by Sir Alfred Munnings. Unsaddling at Epsom, Summer Meeting by Sir Alfred Munnings. An original FATG stamped print. 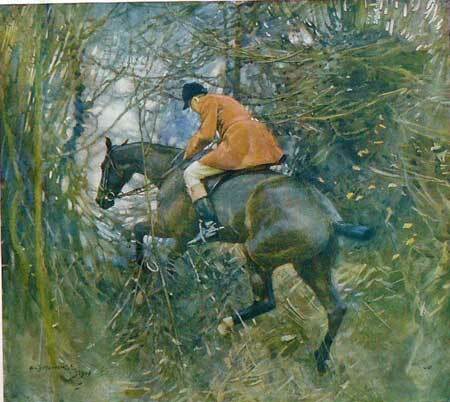 A little Piece of England' by Sir Alfred Munnings. An original pencil signed artist's proof. Frame: 3/4 inch plain black with cream decorated mount. Before the start, Newmarket by Sir Alfred Munnings. Framed in a 2" moulded brown and gold. 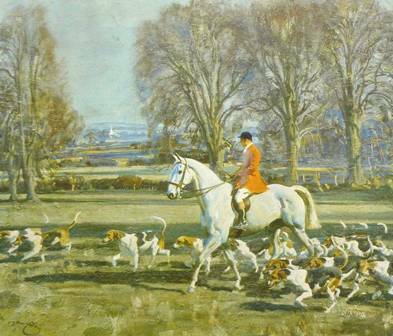 The Master of The Essex Union by Sir Alfred Munnings. An original Frost & Reed Print.